Who Framed Roger Rabbit | WHAT A FEELING! Whatever else one might say about it, Who Framed Roger Rabbit unquestionably represents one of the most remarkable technical achievements to come out of Hollywood in the last decade. This movie is an ambitious blend of live-action and animation, brought together in a seamless, inventive, and sometimes exhilarating combination. It’s the brainchild of Robert Zemeckis, the director of Back to the Future and Romancing the Stone. Having accrued some clout with those consecutive hits, Zemeckis was able to undertake this expensive production (the budget, rumored to be in the $50 million range, was bankrolled by Touchstone pictures—Disney, that is—and Steven Spielberg’s Amblin). 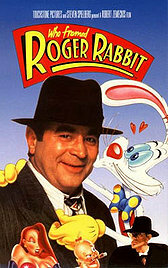 Roger Rabbit was so expensive because of the high cost of animation and the elaboratness of Zemeckis’s design. This movie takes the cartoon/live-action interplay of something like Disney’s Song of the South and whips it up into a silly symphony. In the late-’40s world of the film, flesh-and-blood people share space with “toons,” the animated character stars of the movies. One toon, Roger Rabbit (voice by Charles Fleischer) is framed for a murder, and he must go to a hard-boiled private eye (Bob Hoskins) to help clear his name. Prominent in the investigation is a sinister judge (Christopher Lloyd) who wants to rid the world of toons by dipping them in a nasty green acid. The plot is an excuse for the spectacular visual effects, some movie in-jokes, and a gallery of animated characters. There are cameos by most of the great cartoon figures, including Mickey Mouse, Bugs Bunny, Dumbo, Tweety Bird, and Betty Boop. Zemeckis enjoys rubbing our faces in the amazing effects. Which is typical of him; I’ve always found his movies rather witless, even when they were enjoyable. If it were an ordinary movie, Who Framed Roger Rabbit would be none too interesting. But then, as it demonstrates at almost every moment during its running time, this is no ordinary movie. The absence of the question mark in the title was an early example of puctuaphobia that would creep into films. I never loved WFRR, but have grown to like Zemeckis more since, especially Cast Away and Beowulf. This entry was posted on Friday, January 20th, 2012 at 3:00 am and is filed under 1988. You can follow any responses to this entry through the RSS 2.0 feed. You can leave a response, or trackback from your own site.